Sometimes less is more, and sometimes you can get a lot more instrument for a lot less money. That is absolutely the case with the MX88. I bought it last year after I sold my Nord Piano. While the Nord was a great keyboard in its own right, I simply needed more flexibility, so I decided to let it go as the MX would do that for not a lot of money. At $999, the MX is an absolute steal, and if you are in the market for a versatile gigging keyboard with 88 weighted keys, you should put it on your shortlist. First of all, the acoustic piano sounds and plays better than its more expensive sibling the MOXF. Seriously, I had them side by side, and the MX felt and sounded more natural and dynamic! The rest of the sounds are the familiar Motif XS stuff, although the MX does not sound as crisp as its progenitor, and some of the voices are a little stale and dated. Still, it covers a wide variety of sounds, and combined with its low weight makes this one convenient gigging machine. To add even more value, Yamaha also includes a bunch of software, but I never bothered to download and install those, so they are outside the scope of this review. In the year or so that I gigged the MX88, I really came to appreciate it; it wasn’t the best at anything, but it was good for almost everything. My main gripes with it are the low output level (the Krome that sits on the second tier is a LOT louder), and the external power adapter (which is common for keyboards in this price class). I also don’t love the GHS action, but in the end it is just so usable and practical that those complaints hardly matter. It’s really great what $999 will buy you these days. If you don’t care much about programming your own, this board gives you the sounds of the old Motif XS at a fraction of the price, and that is going to be enough for a lot of people. This entry was posted in ENGLISH, Hardware, REVIEWS on December 6, 2018 by Menno de Boer. I bought these speakers in March this year, after hearing them at NAMM. I have lived with them for a while now and wanted to share my impressions, as there aren’t a lot of reviews of this model yet. Frankly, for a while I wasn’t convinced these were right for me, as I felt they were fatiguing and disorienting. I almost returned them. But boy, now I’m glad I didn’t! They sound very musical, they groove nicely and have plenty of vibe. It’s a modern sound, with surprising bass extension for a modest 5” woofer. It feels like they were tuned for contemporary music production, and they do that very well. Initially I was a little taken aback by the deep bottom end, and tended to mix bass-shy as a result, but I got used to it quickly and now I don’t worry about it. I have found it is reliable and translates well. I also love the green LED, which reminds me of the good old Genelec 1031A, a speaker I have fond memories of. And I really appreciate the fact that the signal path is all analog. I have nothing against DSP, but there is something to be said for this approach. They have enough detail, there’s not much you’re missing on these. Dialing in EQ is effortless, with subtle changes readily revealed, and most importantly there are no surprises in translation. I can just get the vibe right and be confident it’s gonna sound pretty similar elsewhere. If you want to know if they sound like the ADAM A5X, I’d have to say no. I was never fond of those, and always felt they were top-heavy and bottom-lean. The Type 05’s are better balanced to my ears. Then there is the HEDD Linearizer plugin; you can instantiate it in any compatible host and it will noticeably tighten and “dry” up the sound. But it introduces a lot of latency, so I typically only use it when “mastering” (creating mp3’s or wav’s of the final mix). Not everything is perfect, of course. They are pricey for 5” speakers, and the somewhat recessed midrange takes getting used to. People who love their NS10’s are not going to hit the ground running with these. And in my room the vertical sweet spot is somewhat narrow: my speakers are positioned so that the tweeters are at ear height when I’m sitting at my desk. When I stand up, the sound changes noticeably. But in the end, it’s all good. I haven’t tried every speaker in this segment, but I feel the Type 05’s deliver the goods for their size and price. The best compliment I can give them is that I don’t worry about it anymore. I just get on with the job and trust that if things sound right here, they’ll sound right anywhere. And isn’t that what a studio monitor should do? After more than 10 years of (mostly) faithful service, my venerable Roland Fantom X7 was starting to show signs of old age; stubborn buttons requiring multiple presses before engaging, crackling knobs, and this would happen during gigs at times. I wanted to buy a Yamaha Montage 7, but they were in short supply, and I had to buy a new fridge at the same time, so I ended up buying this Korg Krome 73 instead. The rationale was that it should be enough to hold me over until I’d have enough for a Montage or a laptop-based setup. The Krome is cheap, and it shows. It is made of flimsy-feeling plastic, but the upside is that it weighs next to nothing. You can lift and maneuver it with one hand. There are no upsides to the flimsy keyboard action, however. It feels like something from the Fisher Price bargain bin, and it is without a doubt the Krome’s biggest shortcoming. It makes dynamic playing a challenge, as the velocity response does not feel intuitive, and often softer touches are not detected. Also, while it is nice to have 6 octaves, I think it would have made more sense to have an E-E layout, rather than the C-C. that way, middle C would still have been close to the middle of the keyboard. Inexplicably, Korg does do this on the Kronos 73, so why they changed this for the Krome is beyond me. Another pet peeve is the external power supply. Now I understand that is a factor in keeping the cost down, but the thin and bendy wire is simply unsuitable for road use. In fact, an acquainted keyboardist is already on his third power supply, and keeps a spare just in case. But, of course, there is good stuff too. The Krome is cheap, but packed with value. First of all, it has a killer Rhodes sound that is great to play, even on that crappy action. The acoustic piano sounds very good, but it is let down by the action’s velocity response. I suspect that the Krome 88’s weighted action would work great with it. Organs and clavs do the job, and all in all the Krome delivers in the meat-and-potatoes keyboard department. Synth sounds are good, too, but coming from a Roland Fantom I miss the warmth of the pads, and some of the softer stuff. The Krome does bright and punchy, but smooth and mellow is not what this things is all about. Brass sounds are good, too. It doesn’t excel here, but it can definitely hang with the competition here. Despite its shortcomings, I’ve come to like the Krome; as a second-tier board it makes a lot of sense, and it’s great value for money. I do wish Korg would have included USB-audio functionality, as its direct competitors (Yamaha MOX, Roland FA) do offer that. A regrettable omission, but that doesn’t stop me from recommending it to anybody who’s looking for an affordable but great-sounding all-round keyboard. This entry was posted in ENGLISH, Hardware, REVIEWS on August 25, 2017 by Menno de Boer. Disclaimer: I am definitely biased when it comes to Spectrasonics, as its founder Eric Persing was the man responsible for some of Roland’s best sounds in the 1990’s. His sounds just work for me, and Atmosphere and Trilogy were my favorite software synths for the longest time. I have already reviewed Trilogy’s successor Trillian, and now I’ll tell you what I think of Omnisphere, Spectrasonics’ flagship. This does not aim to be an in-depth and thorough review, there are quite a few of them readily available elsewhere, so I’ll simply share what works for me and what doesn’t. For the most part, it sounds bloody great, it covers a wide variety of synth sounds and the only thing I could wish for is Spectrasonics’ take on more conventional sounds like run-of-the-mill piano/rhodes/organ/brass etc. All the good stuff from Atmosphere is included, and I find myself still reaching for them because I already know how they will work in an arrangement and they generally load quicker, as some of Omnisphere’s patches are positively gargantuan in size. Other than sheer volume, the biggest difference between Atmosphere and Omnisphere is the engine. Atmopshere was powered by the venerable UVI engine, whereas Omnisphere is built around Spectrasonics’s own STEAM engine. While the UVI was very reliable and efficient, it was essentially a sample-player, and Spectrasonics needed more if Omnisphere was to be a proper synthesizer. Inside my DAW, Omnisphere is great. You get Spectra’s signature sounds in an 8-part multi-timbral package, with insert and send FX on every channel, great stuff. STEAM needs more cycles than UVI, but on a reasonably modern computer it shouldn’t tax your system too much. So all praise so far, which is boring and what you really want to hear is about the cons, right? Well, there is one thing: there is no standalone version of Omnisphere. I think this is a regrettable omission, as it makes Omnisphere less ideal for live use. In my particular situation, hosting Omnisphere in Mainstage on my humble 2013 MacBookAir is not really a viable scenario. Thankfully, Spectrasonics support pointed me to the excellent VSTLord freeware host app, and it works really great with that (hardly ever taxing the CPU over 30%). Also, cheap it ain’t. And Spectrasonics doesn’t do price drops like some of its competitors do, but the upside of that is that you’ll never have to feel duped when you buy it at full price only to see it on sale at half price one week later. But that’s it. Everything else is great. I have a free upgrade to Omnisphere 2, and plan to install that sometime this year. It’s hard to imagine how it could be better than the original, but I’ll be happy with just as good! This entry was posted in ENGLISH, REVIEWS, Uncategorized on January 23, 2016 by Menno de Boer. I bought this around three or four years ago, when I had my home studio set up in a tiny room with tiled floors, wall-to-wall mirror closet doors on one side and french patio doors on the other. This thing does what they say it does, so you can’t complain, but it is NOT a one-stop solution for vocal recordings. It will eliminate much (not all) of the room sound, but only with moderate levels. It is defeated as soon as a vocalist belts out. I spent $299 on it, and in the end I feel it hasn’t quite been worth it. I moved house and now have a decent amount of acoustic treatment in my home studio; in this situation the Reflexion Filter adds little value. In conclusion, I’d say that if you have no alternative, this thing can help take quite a bit of room out of your signal. But it is no silver bullet, and I question the wisdom of forking out $299 for this. Perhaps that money is better spent on room treatment. This entry was posted in ENGLISH, REVIEWS, Uncategorized on January 4, 2016 by Menno de Boer. I can keep this review pretty short; like its predecessor Trilogy, Trillian is THE definitive bass sample library. 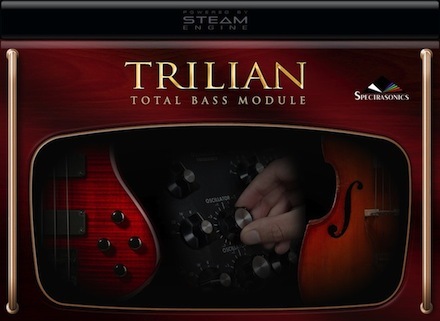 That said, there are certain synth bass tones in NI Massive that I prefer for some things, but as a one-stop-shop bass solution, Trillian is the business. But as good as the synth bass sounds are, the library’s true strength is its excellent acoustic and electric basses. These are simply in a league of their own, nothing else comes close. Indeed, you’d have to have a pretty great bass-player and premium signal chain to approximate the sound quality on offer here. Playability, too, is second to none. Most of the stuff feels lively and responsive, although I typically set a MIDI velocity limiter at value 125, to avoid trigger the slides etc. While it is cool and fun to play with, it can be distracting and somewhat restrictive in conjunction with the velocity response of my Roland Fantom X7. Compared to Trilogy, the tweakability has been noticeably improved. Each sound has a few quick controls assigned to the most relevant parameters, but the old edit pages are still there. Multi-timbral operation is logical and intuitive, and many synth sounds really lend themselves well for exploration beyond the bass register. One of my personal faves is using the Chapman Stick as an electric guitar! Drawbacks? Nothing much. The new acoustic and electric sounds are huge and can take up to twenty seconds to load (I run them off a dedicated 7200rpm HDD), and I often grab legacy Trilogy sounds because they load faster. Oh and you’ll need a lot of RAM for the new sounds, too. Otherwise, I really can’t think of anything else, it is that good. Trillian is not cheap, but it sure is worth every penny. This entry was posted in ENGLISH, REVIEWS, Software on May 20, 2014 by Menno de Boer. Looking at past reviews, I see that I am never enthusiastic about the “good deals” I got. The sweetness of the lower price is not yet forgotten, but I never feel that it was money well-spent. 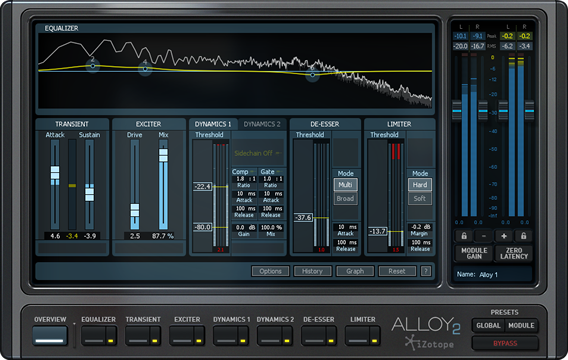 As I keep saying, my impulse buys are rarely good ones, but Izotope’s Alloy2 is the shining exception. It was not on sale, but the regular price ($199) is extremely fair, considering all that you get. Alloy 2 has 7 sections: an EQ, a transient shaper, an exciter, two compressors, a de-esser and a limiter. Each of these can be individually switched on and off. The transient shaper, exciter and compressors have multi-band functionality which greatly enhances their usefulness. But you can get the details from Izotope’s site or other reviews, so I’m gonna skip all that and get right down to business. This thing sounds seriously good. It doesn’t do vintage or classic stuff, but it does digital, and it does digital right. At the risk of offending legions of pro engineers, the presets in this thing are fantastic. They provide excellent “ballpark” sounds, which serve as great starting points for further tweaking. And not a lot of tweaking is needed, typically it is adjusting thresholds etc. and pretty soon you’re good. I use it mostly for vocals and drum buss, and it is excellent on both. Most of the presets sound very current and up-to-date, many of them designed to give you that ‘boom, now it sounds like a record’ feeling. To really get it right, you’ll need to dive in there to finish it up to make it ‘sit’, but a lot of the hard work has been done for you and in my case, many of the presets are great time-savers. For those who prefer to start with a clean sheet: all the different blocks give you an amazingly versatile and superb-sounding tool that allows to sculpt and mold the sound to your heart’s content. It’s hard for me to think of true negatives; I think the exciter is probably less impressive in isolation. It distorts pretty quickly but at modest levels it doesn’t appear to do much. That said, whenever it is active in a preset it is easier to pick out what it does by switching it on and off, so perhaps it is simply my ineptitude. Also, this is a modern plugin and you’re not gonna run 500 instances of this on your MacPro. It is not too heavy considering all it does, but it does take cycles, and when you have a lot of instances open, you will notice. In conclusion, Alloy 2 sounds great, has excellent presets for those who don’t want to be bothered, offers deep control for those who need it, and generally delivers on all counts. I think it is well worth the $199. This entry was posted in ENGLISH, REVIEWS, Software on May 5, 2014 by Menno de Boer.